Present state: Demolished - the site is now occupied by a car park, newsagent, youth centre and police station. A goods shed survives and the newsagents at the end of the car park is the former station building. Notes: Ilfracombe was the subject of numerous unsuccessful schemes, including rival L S W R and Devon & Somerset Bills in 1864. An eventual agreement for a joint line of mixed gauge broke down when the Devon & Somerset could not pay its share. A new approach was made by the Barnstaple & Ilfracombe Railway, a subsidiary of the L S W R, receiving Royal Assent on 4 July 1870. Engineering works were heavy, with a tunnel above the Slade Valley and an S-shaped bridge over the Taw at Barnstaple as well as almost continuous embankments and cuttings, except in the section beside the Taw estuary. There were steep gradients, down trains climbing three miles at 1 in 40 and then dropping at 1 in 36 for two miles round sharp curves to the terminus perched spectacularly on a cliff edge above the town. During its first years the Ilfracombe line had lightweight rails, and only selected rolling stock could be used. The year before the opening the Devon & Somerset Railway launched a coach service from its Barnstaple terminus (the present Victoria Road) to Ilfracombe. This continued in hot opposition to the L S W R until 1st June 1887, the opening date of the mile-long loop from the terminus round the outskirts of the town to Barnstaple Junction. Barnstaple Junction, just called Barnstaple till the opening of the Quay station on the Ilfracombe line, had its down island platforms added in May 1874 in readiness for that event. Barnstaple Quay was replaced by Town on a larger adjoining site to the north in time for the opening of the line to Lynton in 1898 which had a terminal bay at the new station. The Ilfracombe line was initially single track but was doubled in three stages between 1889 - 1891, although the bridge over the River Raw remained single. 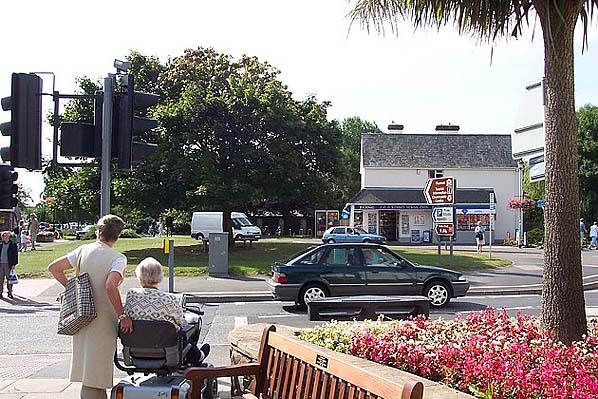 On 1st July 1905 the Barnstaple eastern spur was opened completing a triangular junction outside the G W R's station (later Victoria Road) permitting Taunton - Ilfracombe trains to by-pass it. For a long time the G W R played an important part in Ilfracombe's development, the journey from Paddington being considerably quicker than that from Waterloo. 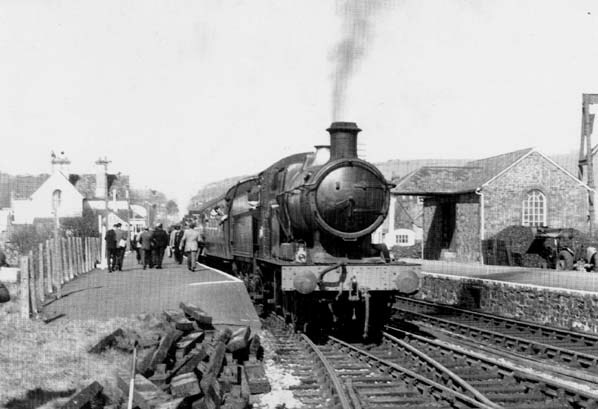 Traffic on the Ilfracombe line reached its peak in the mid 1930's. The line proved popular during both wars with Ilfracombe providing a welcome break from war time stress. Although the line did not close after the 'Beeching Axe', the goods service was withdrawn and the line was singled with a new DMU service being introduced. However the popularity of the car ensured that the branch lines days were numbered. 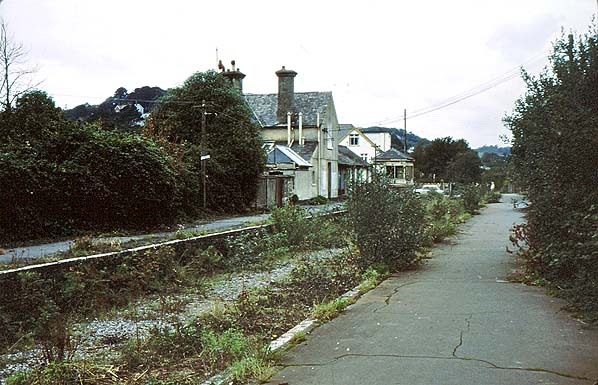 By the late 1960's the line was beginning to look very derelict and the end finally came in 1970 with the last train pulling out of Ilfracombe at 7.55 p.m. on 3rd October. Almost at once a preservation society was formed to take over the 14 miles of track. Steam for the holiday crowds was the main aim but a survey showed a need for a diesel service at least from Braunton - Barnstaple. A class 4 tank at the Barry scrapyard was reserved for the society and worked on by enthusiasts. remaining hopes of reinstating the Ilfracombe Railway. The trackbed between Barnstaple and Braunton is now part of the Tarka Trail cycleway. There are a number of signal posts along the Tarka Trail. 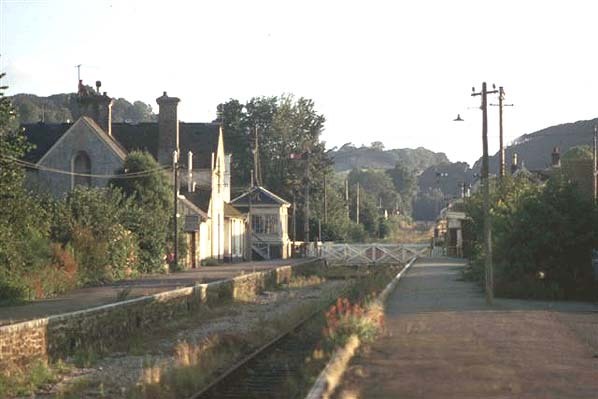 Braunton Station looking north in Summer 1980. Looking south across the site of the level crossing to Braunton Station. 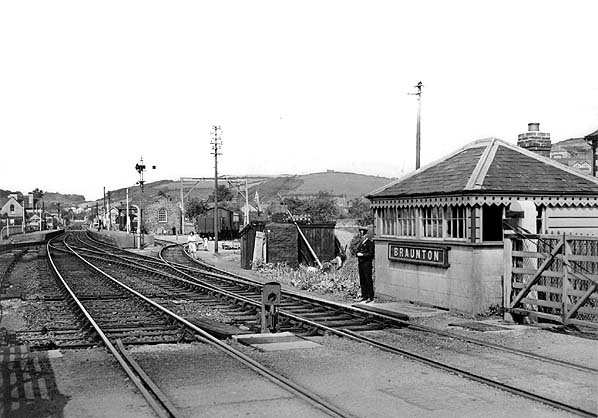 The newsagent on the far side of the road is the stationmaster's house and part of the main station building on the platform.